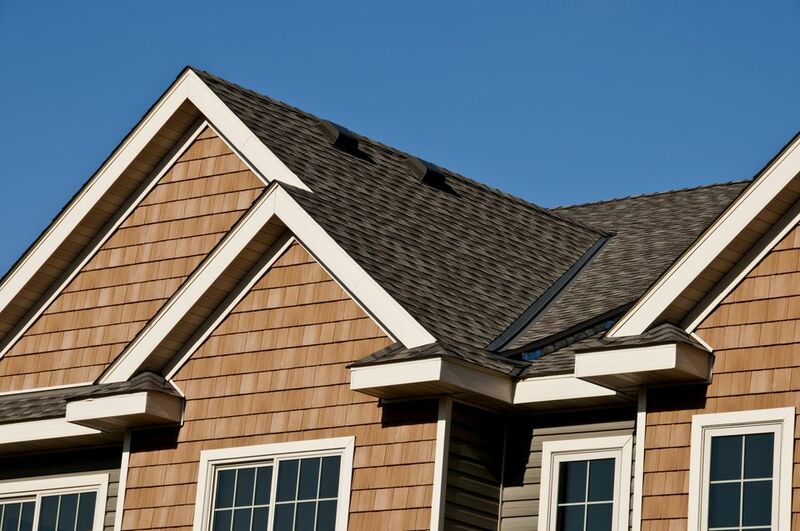 There are two primary types of ridge vents: shingle-over vents and aluminum vents. A shingle-over vent is installed over the ridge of a roof and is covered over by asphalt shingle caps that match the surrounding roof shingles. An aluminum ridge vent has a mushroom-shaped profile combined with a wide flange on both sides that sits on top of the roof shingles. The vent is the finished product and does not require additional asphalt shingle ridge caps. The ridge of the roof is prepared similarly for both types of ridge vent. If you plan to install the vent yourself, be sure you're really up for the challenge. This project requires work on a tall ladder and the roof while using hand and power tools. If you have any anxiety over heights or are not quite sure you know how to handle your tools, consider hiring a professional. For safety, always wear fall-arresting equipment when working on a roof. Be aware that a ridge vent is only one part of properly ventilating your attic space and roof. For a ridge vent to work properly, it relies on passive airflow, or intake air, coming into the attic space via soffit or gable vents or other attic ventilation. Start by removing the nails holding the ridge cap shingles in place. For most asphalt shingle ridge caps, there are two nails in each ridge cap, one on either side of the ridge. Insert a flat pry bar under the shingle cap and lift up on both the shingle and the nail head to loosen the nail, then pry out the nail. Remove the shingle cap. Use a utility knife with a hook blade to cut the shingles back 3 inches (or as recommended by the vent manufacturer) from the ridge. Remove all felt paper or underlayment from the ridge to expose 3 inches of the wood decking along the ridge. The next step is to cut the wood decking back along the ridge. It is best to create a minimum of 1 inch of clearance on either side of the ridge board (ridgepole) to allow airflow through the opening and into the vent. If there is no ridge board present, as with some truss-framed roofs, the opening should be at least 1 inch from the ridge on both sides. Measure down from the ridge on each side and snap a chalk line to mark cutting lines on the roof decking. Remove all framing nails that are above or running through the chalk lines, using a cat's paw pry bar and a hammer. Secure the decking below each chalk line with new 8d nails driven into the roof rafters or trusses below. Cut the decking along the chalk lines, using the circular saw. Be sure to adjust the depth of the blade so that the saw cuts through the decking only, not the rafters or trusses. Remove the waste strips of decking from along the ridge. Install new field shingles, as needed, to cover any areas of exposed decking. In addition, reattach the existing courses of shingles with roofing nails so they are secured along the top edges where the shingles were trimmed back. The final step is to install the ridge vent (and cap shingles, as needed), using the appropriate steps for your system. Place the shingle-over ridge vent along the reference line and nail the ridge vent to the decking along that side, as directed by the manufacturer. Attach the other side of the vent to the opposite side of the ridge to fully secure the vent. Install asphalt shingle caps over the vent, using the nails recommended by the manufacturer. Measure down and mark the manufacturer’s recommended distance from the ridge, then snap a chalk line through the marks to create a reference line. Apply polyurethane caulk to the underside of the flange on both sides of the vent, as directed by the manufacturer. Position the aluminum ridge vent along the reference line. Fasten the vent to the roof decking and rafters (or trusses) by nailing through the flange on both sides of the vent, using the nails and nail spacing recommended by the manufacturer. Add any connectors and end caps that came with your ridge vent system to ensure the vent is watertight.